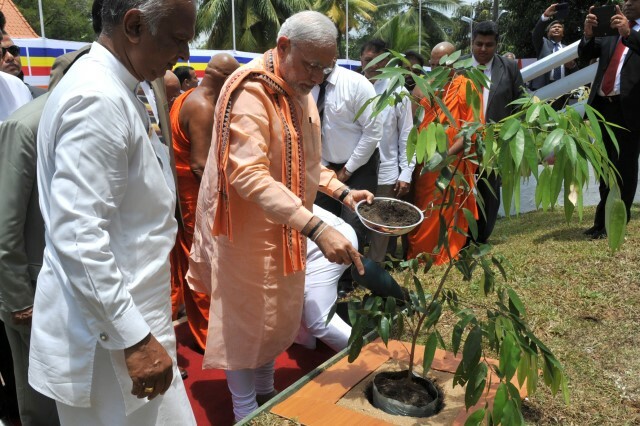 The Prime Minister of India Shri Narendra Modi will initiate a tree plantation campaign on June 5, the World Environment Day! What’s more, the first sapling will be planted by the Hon’ble Prime Minister at his official residence, 7 RCR. To commemorate World Environment Day further, the Indian Cricket captain Virat Kohli and international wrestler Sushil Kumar will also join in and plant saplings at Paryavaran Bhawan. The Ministry of Environment, Forest and Climate Change (MoEFCC) is celebrating the World Environment Day on June 5, 2015 by planting saplings across the country. On the evening of June 5, Sachin Tendulkar, Ajinkya Rane and Rohit Sharma, along with Environment Minister Shri Prakash Javadekar and Maharashtra Minister for primary, higher and technical & Medical education and Culture Shri Vinod Tawde and others will also plant saplings in Mumbai at Joggers Park on Carter Road. Cricketers Yusuf Pathan and Irfan Pathan will join Ministers and other local leaders in planting saplings in Vadodara. In Indore, Narendra Hirwani, Sanjay Jagdale and Gopal Sharma will join Madhya Pradesh’s Urban Administration, Housing and Environment Minister Shri Kailash Vijayvargiya and other local leaders in the plantation campaign. The Indian Cricket team, along with BCCI Secretary Anurag Thakur, will participate in a plantation drive in Kolkata on June 6. Renowned boxers Mary Kom and Sarita Devi, billiards player Geet Sethi and hockey player Viren Rasquinha have also pledged their support to the campaign and will also plant saplings wherever they are on June 5. There is also a plan to launch a pilot project on Urban Forestry by the MoEFCC in Pune on June 6. Seventy acres of forest land in Pune is being compounded and about 4, 000 trees will be planted on it. This project will be run through public participation in the form of a Memorial Garden. People will pay Rs 2, 000 per tree and that tree will be named after their beloved ones. This project is being called Nagar Van-Udyan Yojana (Urban Forest Plan) and will be financed partly from Compensatory Afforestation Fund Management and Planning Authority (CAMPA) Funds. The Vision of the project is to develop forests within urban areas in the years to come. According to the Environment Minister Shri Javadekar, the MoEFCC has already piloted a bill in Parliament to release nearly ₹ 35,000 crore under CAMPA to all the states, so that they can make more efforts for greening degraded forest areas, adopt best wildlife management practices, change the quality of the existing forests, to convert moderate forest to dense forest and many such forest activities. Its great initiative, as global warming is a big threat for human life we need more are more trees.